Magnetic separator for manual separation using kits in high volumes. 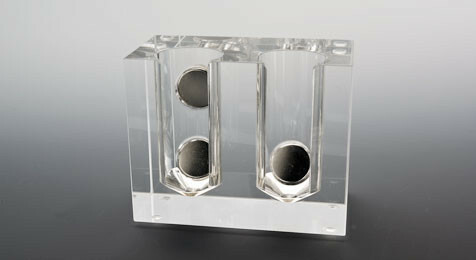 Consists of a clear Plexiglasblock with 2 holders for 50 ml tubes. One duct with one magnet for separation from a maximum 25 ml volume and one with two magnets for separation of a maximum 50 ml liquid volume.